I hadn't been seriously considering doing any purification programs or cleanses. That changed when I was dropping off some "Thank you for referring your patients to me for Active Release Techniques" gifts to local medical doctors and chiropractors early on the week of Christmas. I'd seen this doctor last in mid summer and he was chubby then. Now he looked cut... really ripped. I asked how he'd done it and he shared that he went through the Standard Process Purification program. He shared that he lost either 22 or 26 pounds during the 21 day program and then had continued to lose around 60 pounds. I'd guess that he started at maybe 6 foot and 260 pounds. He shared that he has higher energy levels, is running 15 miles per week, and lives a life in congruence with his recommendations to his patients. Those all sounded good to me! On returning to our office I talked with Calli, our Office Manager and Practice Representative, about the other doctor's results. She shared that she had heard a similarly positive report from the pastor's wife at her church. Over the next few days leading up to Christmas, Calli and I both did some searching online to find out more about the program as well as any reviews of it. We found some very positive blogs by people who claimed to have done multiple different types of cleanses and purifications. They seemed to think this one was the best. When we got back into the office on the Monday after Christmas we had both decided to get the program. We ordered them on Monday and they arrived on Wednesday. I remember during chiropractic school how some of my classmates were very focused on nutrition to heal the body. Not me. I was pretty focused in on just chiropractic care. One memory in particular stands out. One of these classmates shared that she was dealing with some digestive issues. The solution: supplemental dirt, by Standard Process. I remember thinking she was crazy. For the rest of school my friend and I called her (not to her face) Jenna the Dirt Eater. Since then I have seen some amazing results with some nutritional supplements while working out in Washington and at Compass Chiropractic. Now I'm doing my first purification. Maybe eventually I will be a true nutrition nut. For the recent past I have definitely had some guilty pleasures. For instance, my favorite fast food item is the Taco Bell Grilled Stuft Burrito with extra Baja Sauce - probably about 1200 calories and 3 days worth of sodium and fat. I probably had either some chocolate or ice cream each and every day. Also I was definitely addicted to caffeine. I had some coffee in the morning and then a soda (or sometimes two) in the early afternoon. 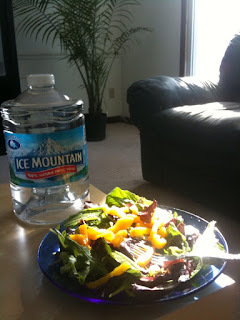 Other than that, I ate pretty healthy :) I graduated from chiropractic school in early 2006 at a bit over 170 pounds. I didn't weigh myself for a few months after moving to Washington State and when I did in the fall I had somehow lost 15 pounds without trying. At first I thought maybe I had cancer but eventually just came to the conclusion that I was eating a little bit better and that the 8 to 12 mile hikes in the mountains I'd go on a couple times a month must be having a positive effect. My weight stayed between 150 and 155 through the rest of my stay in Washington. 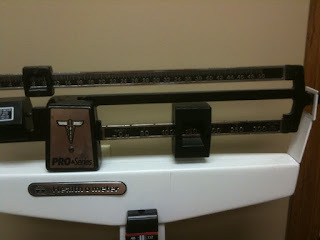 When I moved back to Iowa in late 2007 to open Compass Chiropractic I was pretty close to 150 pounds. Within a couple months of living in Iowa I think I was up to 170. Something in the water? Probably not. I had just opened a new clinic and was working late and not eating healthy. There was some stress in the mix and I wasn't exercising very regularly, other than daily walks with my dog, George. I haven't improved since then. On January 2, 2010 at weigh in I was at 174.75 pounds. What you get: 2 containers of SP Complete protein powder and other whole foods shake mix, 4 bottles of supplements which improve the function of your liver and kidneys and keep the bowels moving smoothly, and a pamphlet with instructions and acceptable food lists. Days 1-10: You have 2-3 protein shakes a day with fruit and ice. You take ten gel caps of the supplements three times a day with the shakes. Besides that you have either a half cup of brown/wild rice or lentils. The lifesaver: you can eat as many servings of unprocessed vegetables and fruit as you'd like. However, they have to be in a ratio of at least two servings of veggies to one fruit. As much as possible you are supposed to buy organic. Of course, everything bad is off limits as well - caffeine, alcohol, tobacco. You can, however, have some flax oil in your shake or make some tasty natural salad dressings with olive oil, basalmic vinegar, and herbs. You're supposed to have only spring water. Days 11-21: Same as before except you can now have some servings of natural seafood or chicken. Also you take a few less gel caps of supplements each day. Exercise: You're supposed to walk 40 minutes four days a week through the program and hold off on any intense exercise program. I am really excited about how this has gone so far! The first day I developed a bit of a headache which may have been from lack of caffeine. Other than that I haven't had any of the negative reactions I thought might happen as far as headaches or digestive issues. I weighed myself today at 169 and there seems to be some shrinking of my muffin top. Cravings: Surprisingly, I am not really dealing with cravings for sweets, salty foods, carbohydrates, or dairy. I am feeling pretty determined though and am starting to feel a bit competititive within the office to have the most drastic results. Also I have shared with enough people that I am doing this that I feel pretty accountable not to slip up. One lifesaver has been that Clementines are in season. I've been having three to four a day at the times where I normally might reach for a sweet snack. Hunger: If you're hungry on this program it's your own fault. After all, you can eat as much as you want. Thank God for baby carrots though. They have been lifesavers as they have enough bulk to make me feel full during the day at the office. I think I've eaten more in the last 8 days than I had in my entire life. It sure takes a lot of salad to feel full! As long as you have access to a fridge during your work day I would think most people would be able to keep from being very hungry. If you're out driving around you soon realize there are no restaurants that you can go to. Caffeine: I made it 7 days with no caffeine and wasn't having withdrawal symptoms or anything. I just missed having my nice cup of coffee each day. Today I broke down and had some coffee (black with no sugar of course). I'll stay off the soda through the end of this and maybe permanently but came to the conclusion that I'd definitely have some sort of caffeine in the future so I might as well have some now. I don't think it will hurt the diet aspect of this program. Energy: I was worried my energy levels might totally tank for a few days. However, they have held pretty steady except for the second day of the program when I took a 3 hour nap and still went to bed pretty early. During my work days I hit a little bit of a low spot in the late afternoon and early evening. Now that I've cheated with the caffeine I'll probably have some black coffee to get me through those periods. I have been doing some weight lifting and there is definitely a decrease in both strength and stamina when I lift. I've gone swimming a couple times as well and notice just a little bit of decreased stamina with that but I'm not pushing it hard. Water: I stocked up with a few jugs of the spring water at the beginning but the first day I was at the gym and had forgotten to bring a bottle so broke that rule right away by drinking out of the water fountain. I've been using a mix a tap and spring water since. I am not as purified I suppose but I am losing weight anyway. Shakes: At first I was doing the protein shakes with frozen fruit, water, banana and the powder as recommended. However I was making the mistake of thinking that adding more fruit would eventually make it taste great. The shakes taste good in a healthy way but I will just tell you that you can't add enough fruit to make it taste like Jamba Juice or Orange Julius. Since I'm loving the Clementines and getting quite a bit of my 1:2 fruit to veggie ratio through those, I keep the shakes smaller with less added fruit. Produce: Costco has some big containers of organic produce that helped me get stocked up for the first week. I think I cleared a 3 pound bag of baby carrots! 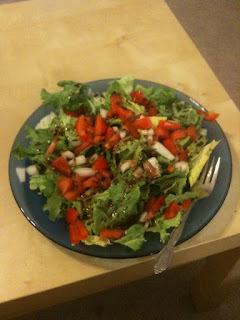 If you're not a salad lover to begin with definitely be prepared with the supplies to make the dressings! Tomatoes: On Day 6 I saw Calli eating tomatoes and started harassing her for cheating as they weren't in the allowed vegetable section (along with corn). It turns out they're in the fruit section. I've enjoyed adding them to some recipes yesterday and today. Exercise: I definitely don't consider myself a gym rat. I usually try to do most of my exercise outside. 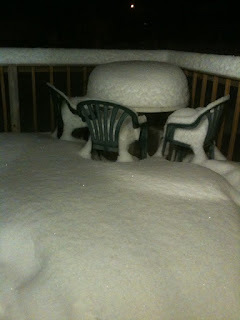 It's been terribly cold though with a couple feet of snow so outside workouts have been out of the question. However, I have really been enjoying going to the southside Aspen Athletic Club now that I'm doing this program. They have a three lane, 25 yard pool with non-chlorine purification that never seems to be busy. Also the brochure recommends trying other types of body purification such as saunas so I've been doing that a bit there. Lastly, they have mirrors everywhere so just walking around between the weights gets me more motivated to stick with this, especially as I start to see some visible improvement. Today I definitely worked out harder than the program recommends: 3 miles on the treadmill in under 30 minutes and 1000 yard swim at a pretty good pace. No fainting or lightheadedness, thankfully, but I did load up on baby carrots right before going and made sure to drink plenty of water. Social Situations: I have made it through a BNI breakfast club meeting at the Machine Shed, a party for the Hawks' bowl game, and a Buccaneers Hockey game without cheating despite tons of tempting foods within reach. In those situations I made sure to stuff myself with acceptable foods before going! Advice: prepare to be harrassed a bit when people notice you're not having anything and hear why. 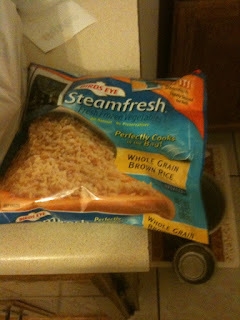 Brown Rice: Calli found some program-acceptable brown rice in a convenient microwavable bag. I'll put a pic below. Lentils: I don't think I'd ever tried lentils before but the pamphlet recommends them more than the rice if you're interested in cutting weight so I've gotten my fair share. They are basically like little disc shaped tasteless beans. The first couple times I tried them I thought they were OK. Soon they started to get pretty gross though. I think I just need better recipes. 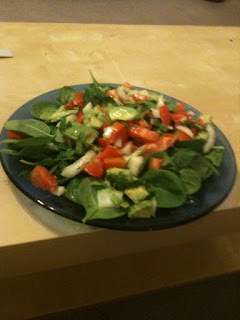 Salads: At first I tried to be as healthy as possible by purchasing bulk containers of dark field greens and spinach from Costco. They were both a bit rough for me as I'm not really that much of a vegetable lover. 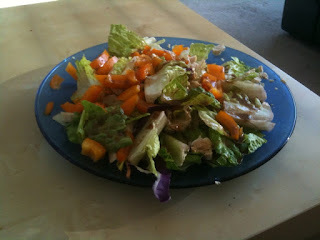 Today I had a salad with Romaine and it had amazing flavor compared to the others. I might not eat any spinach through the rest of this. Blender: Some day I dream of having my very own Vita-mix. Until that day when I feel like spending $400+ on a blender, I do recommend the Oster Classic Beehive that I have. I did a lot of research online when I was out in Washington and at the time that seemed to be the most recommended blender under $100. If I didn't have the Beehive going into this I would consider getting the Ninja Master Prep that I recently saw on an infomercial. I looked it up online and it got some great reviews. I was disappointed that Consumer Reports left it out of their recent testing of most popular infomercial products. I would have loved to get their take on it. Speaking of Consumer Reports, did you hear that Consumer Reports found that chiropractors are the highest rated professionals and chiropractic adjustments the highest rated treatment for back pain? Tech Gadgets: Normally I am not that much of a gadget guy but I have appreciated my Iphone through this process. It's been great for making "To Buy" lists, taking pics of fresh looking meals, accessing the Standard Process website anywhere, keeping a note on weight loss, and listening to great music and Dave Ramsey podcasts to stay motivated. I downloaded an app with hundreds of exercise instructions but haven't really used that. 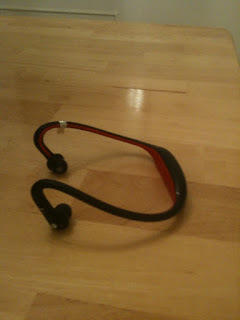 I'll put a picture of my new-at-Christmas Motorokr S9 Bluetooth wireless headphones below. Thanks for those, Mom and Dad! 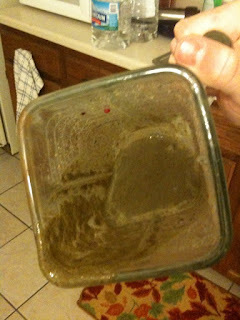 SP Complete Smoothie - I think this one had some frozen tropical blend fruit in it. 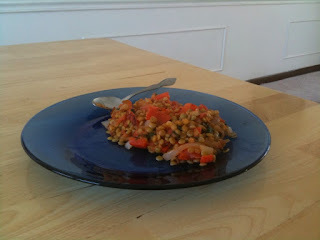 I was really excited about what was supposed to be a gourmet lentil dish that I came up with all by myself - stir fried tomatoes, onions, peppers, fresh cilantro, then mixed with the lentils and with a squeeze of fresh lime on the top. Nasty! Don't try this at home! I definitely wasn't eating any meals out on the back porch! - No major restrictions when out with friends and one weekend day a week. I'll probably update again at the end... hopefully with close to 15 pounds lost and a significantly more sculpted bod. I'm now down to 162 pounds.... on a full stomach! I passed the 10 pounds lost mark by the end of the second week so fully anticipating reaching my goal of losing at least 15 pounds by the end. I wish I would have measured my waist to see the changes there. I'm loving this experience. I'll write a bigger summary of the last half of it at the end, but so far I'd say this is one of the most empowering things I've done. It is great to feel in control of your health future! Being able to add the chicken and fish at day 11 has been great. When we started this, I think Calli and I both envisioned ourselves going to town on the first day off the program. Recently, we've both shared that we may essentially continue with the program until we reach the weight/body shape we want to be at. We have both built a lot of momentum and it just sounds easier and better to continue than to take an immediate step back. The desire to eat unhealthy foods just doesn't feel that strong anymore. My opinion of the program hasn't changed. It has been one of the best things that I've ever done and has given me a great sense of accomplishment. I feel empowered to continue to control my health, weight, and body shape. I haven't officially finished the 21st day. Still when I weighed myself this afternoon I had reached my goal weight loss of 15 pounds. Using a BMI calculator, my BMI dropped from 27.3 (overweight) to 24.9 (normal weight). Visibly, I feel my face is noticeably thinner and I've been able to wear some pants and shirts that I had "outgrown". It turns out I do like fish. Prior to doing this I knew I liked salmon and fresh stream-caught trout. I didn't have either on a regular basis. With recommendations from patients and coworkers, I've been having some frozen tilapia filets. I just defrost them in their packages in warm water. Then I coat them in olive oil and a little pepper and a squeeze of fresh lime or some bottled lemon juice. Then I put them on the George Foreman for 5-6 minutes and pull them off and put on a little bit more lemon. Delish! Keep an eye on me from here. My plan is to continue with this plan until I reach my desired body shape while adding some low fat cottage cheese, yogurt, and milk and a bit more variety of protein such as some shrimp salads. More pics of my meals are below. Typical work lunch after day 10 when I could have some chicken or fish. 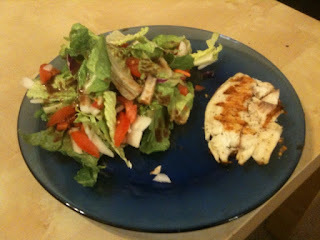 First George Foreman grilled tilapia meal = easy, delicious, and nutritious. I found this recipe on the back of the brocolli slaw bag. Prior to the program, I ate this brocolli salad pretty often but I'd add to it craisins, bacon, smoked ham, pine nuts/sunflower seeds, and some sugary cranberry vinagrette by Maple Grove Farms. During the purification program I found that the suggested recipe on the back of the bag of brocolli slaw was quite nice and totally kosher by the program. 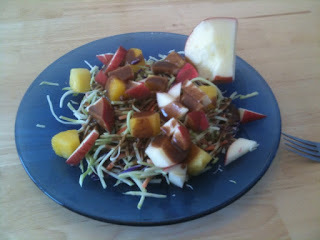 This salad has pineapple cubes (defrosted from a no-sugar-added frozen fruit bag) fresh sliced pinata apples, and purification approved homemade vinagrette dressing. Since ending the Standard Process Purification program, I let loose a couple times... both ended up being at social pizza parties. Other than that I've been following the program plan pretty closely with a couple exceptions. I've been having some low fat cottage cheese and milk. I have still not cheated by eating any significant sweets or fast food! I'm amazed by myself. The results? I'm down 18 pounds total in one month since starting this program. I have just a few to go to get to where I want to be. Very excited but starting to have problems finding clothes that fit me. I must have taken some of my thin clothes to Goodwill during my chubby period. I weighed in today at two months from the start and I'm down 24 pounds from the start to 150.75. Lately body changes have been more drastic than pounds lost. My love handles are nearly gone. Signs of a six pack are starting to show. I do a quick weight lifting circuit two to three times a week and more veins are popping out on my arms than ever before. I really don't have a starting point to go by as far as body fat but improvements are definitely being made. I still credit the Standard Process Purification as the jump start to a great change in my health, and expect to be able to keep this new lifestyle up long term. PS I probably would have made even more changes but I still have a weakness for icecream and pizza. Once you decide you like a "pure" recipe such as a soup, stir fry, or dressing simplify it by making bigger batches. This gives you the best shot at turning the program into a lifestyle by making healthy foods as convenient as the non-healthy ones. I've been making smaller batches of the SP recommended basalmic vinaigrette with seasoning via McCormick's Italian Seasoning Grinder. I realized tonight that even though the stuff tastes great I haven't been having that many salads because I've been keeping my small batches in little rubbermaid containers with wide mouths. They splatter the dressing all over the desk at work when I reclose them. Tonight I made a bigger batch and put it in an empty full size dressing bottle. Now my homemade, healthy, and delicious dressing will be just as convenient as the corn syrup laden dressing that previously occupied the bottle. A couple friends who did the program tried one of the vegetable and lentil soup recipes. They liked it so much they'd make a batch big enough at the beginning of the week to cover all their lunches. Tonight I also made 3 healthy smoothies to freeze overnight and have on hand to take the edge off of mid day hunger. We're heading into a potentially record breaking week at the office so I need to be full of energy! The bottom line: with a little planning up front, healthy doesn't have to be hard. As Scrooge McDuck would say, "work smarter, not harder." I weighed myself today, 6 months after starting the Standard Process Purification Program at 146. I'm down nearly 30 pounds since starting the program. Interestingly, I feel like I have not been doing very well in my eating for the last couple weeks and frankly expected to be above 150 but apparently I am doing well enough anyway. I am training for a triathlon but honestly, I am only getting workouts in like 3 days a week. If I hadn't done the purification program I might have dropped 2 pounds through exercise alone. It was a fun night when I went pants shopping and realized I'd gone from a 34 inch waist to a 30. Lately friends have been telling me that I need to exercise more or lift weights to "get toned." They're wrong though. Obviously you have to have the muscles but that "ripped" look only can be obtained by decreasing body fat, which the program seems to accomplish very effectively. We have had about 12 patients, staff, and family members now do the purification program. On average I'd say people lose 8-9% of their body weight. Most everyone has had a positive experience. My sister did it and really struggled during it because she doesn't like vegetables much. However, I was pretty pleased that when I talked to her a couple days after completing it she shared, "It was funny because I went to grocery store yesterday and when I was all done shopping I looked down at what was in my cart and almost everything in there was the same things that I would have been eating during the purification." Nice to hear that it potentially helped her make a long term change for the better. My allergies are so much better this year. I can't really attribute the change to anything else but it has been quite a contrast! I'm planning on doing another round of the purification after I compete in the Hy-Vee Triathlon on June 13. Even though I'm pretty happy with where I'm at weight-wise, I still have my "ledge," a roll at the bottom of my belly and also a little extra padding in the love handle region. I'm ready to get rid of those once and for all. Also, I'm looking forward to getting back on track with eating healthier (icecream season is not good for me). The best thing about all of this: I think that my second time through the program will be incredibly easy. I know exactly what to expect and I'm looking forward to some veggie and lentil soup. On June 14 after completing the Hy-Vee Triathlon I decided to do the Standard Process Purification for a second time. I weighed in heavier than expected at 154 pounds (my mom was down the week before and we did enjoy a week of dining out). The second time through I found some parts of the program easier and some harder and learned some more tips and tricks along the way. Pickles - Though perhaps not totally approved from a purification perspective, pickles seem to be ok from the weight loss perspective and I enjoyed them as an afternoon or evening salty snack where in my normal life I might be tempted to have some chips and salsa. Lentil Soup - Who would think a person could be so excited about lentil soup. 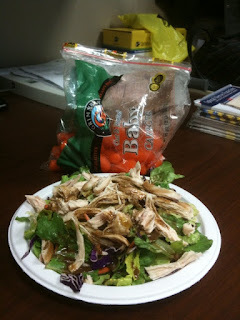 I was having trouble finding enough time to have enough for lunch to feel full through the afternoon. The lentil soup was filling and kept me full through the afternoon. Sun-dried Tomatoes - Costco has some of these with spices and olive oil. They made some pretty fantastic salads but I had to make sure not to go overboard. Grilling - Grilling can help make the purification more tolerable. I had a friend over and served grilled salmon, grilled pineapple rounds, stir-fried Birdseye vegetables, and brown rice and she loved it. With the right attitude and some creativity eating healthy doesn't have to be boring. Though overall the purification was easier, it was harder to be good during icecream season. I definitely love icecream. The rest of my purification posts are linked below along with some pictures from my second purification. Results: At the end of the purification I reached 138 or 139 pounds... definitely the lightest I've been since highschool. I am pleased with how it went and am glad I did it again. Now I'm looking forward to seeing the trimming of the fat help me run faster in the Okoboji Half Marathon on July 17.